Blacks have lived and worked in Maine as early as the seventeenth century, but historically have constituted less than one percent of Maine’s population. Probably for this reason, books on Blacks in New England have largely ignored the experience of African American Mainers. 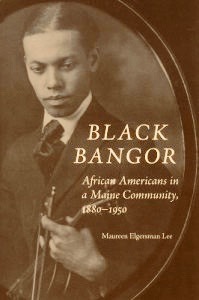 Black Bangor is the first major published study of a Black community in Maine. This tightly woven case study examines the African American community in Bangor during its heyday, 1880 1950, the period that saw an unprecedented migration of Blacks to that city. Blacks migrated to Bangor not just from other New England states, but from the Caribbean and Canadian Maritime Provinces as well, creating a heterogeneous community with roots in two hemispheres. Constituting an “ultraminority” in Bangor (according to the census, Blacks never numbered more than 300 souls during this period), this diverse community nonetheless came together to establish an impressive range of institutions, including local chapters of the NAACP and Odd Fellows, as well as of Mothers and Junior Mothers Clubs. Concentrated in an area known as the Parker Street neighborhood, Black women in Bangor became domestics and cooks, caterers and beauticians, clerks and stenographers. Men worked as loggers, teamsters, porters, chefs, and barbers; a few owned businesses. Organized thematically, with sections on migration, labor, daily life, and community, Black Bangor’s topics include not just migration patterns, work, and religious and cultural organizations, but also African American homes, furniture, clothing, and foodways. Elgersman Lee also examines race relations and depictions of Blacks in the local media, and draws comparisons between the experiences of Bangor’s African American population and those of Blacks in other New England cities. This fascinating and exhaustive study will appeal to anyone from Maine, as well as those interested in African American history and the rich texture of the region’s cultural life.